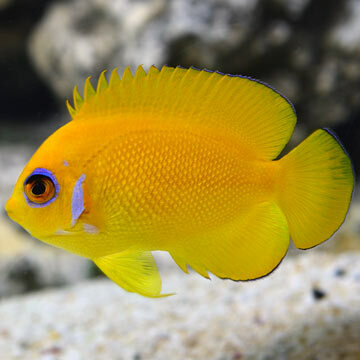 The Lemonpeel Angelfish requires a 70 gallon or larger aquarium with hiding places and large amounts of live rock to graze on the microalgae growth. It is very prone to nip at large-polyped stony corals and clam mantles. It is best not to keep Lemonpeel Angelfish with fish of the same genera – it will definitely fight with others of its own species, and requires plenty of room and space to keep it from fighting with other similar-sized fish. As with other dwarf angels, the major issue is whether this species is “reef safe.” There is no doubt that it will thrive in a reef tank, as it may do so at the expense of expensive invertebrates. Individuals vary considerably in this regard. The alternative is a FOWLR setup. The security and snack foods provided by a live-rock setup will make this angel feel right at home.